For Formula One teams struggling with reliability issues, qualifying can feel like the place where you can run the session, but the results don’t matter. Grid penalties will send you to the back anyway. We’re not even done with practice at Monza and four cars already have grid penalties. It’s too much. It’s been too much for the past couple years. There has to be a better way to handle this. NASCAR, for better or for worse, goes out of their way to make sure the results on track—as seen by fans—are the results of the race as often as possible. Shuffling cars around in the standings is their nuclear option for when someone’s blatantly cheating, or if there’s a too-often-ignored rule they’re really trying to enforce. The reason? No one really likes hearing race results change hours after the race is over. Maybe this is the attitude F1 needs to adopt for qualifying. F1's qualifying sessions are usually a lot of fun to watch. The series itself wants people to watch, too. All the brouhaha about tweaking the qualifying format last year was rooted in a desire to get more people to tune into qualifying. Yet I get frustrated when some of my lovable underdogs qualify relatively well, but still can’t catch a break because they’ve used too many power unit components already this year. The power unit is the catch-all term for the internal combustion engine and hybrid system, divided up into six elements that Formula One defines in detail here. Each team can use a maximum of four of each element before they start incurring grid penalties. We’re barely over halfway done with the season and we’re already seeing teams invoke big penalties. 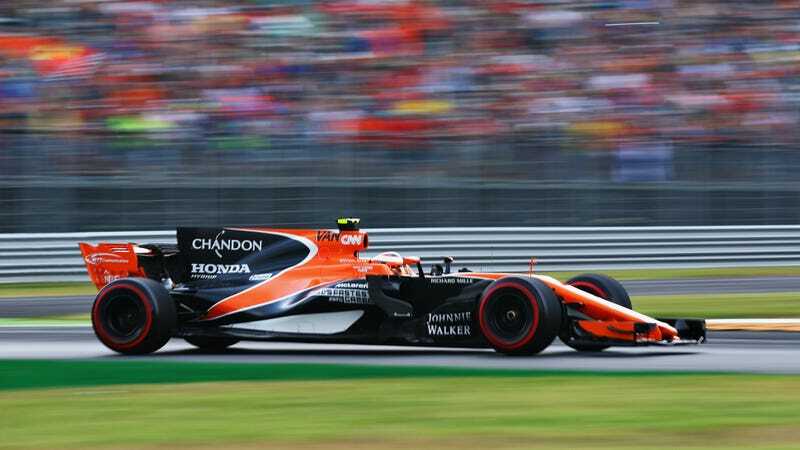 The Italian Grand Prix is only two practice sessions into its weekend, yet we’ve already got grid penalties for Toro Rosso driver Carlos Sainz Jr. (10), McLaren driver Fernando Alonso (35) and both Red Bull drivers Max Verstappen (15) and Daniel Ricciardo (20). Sainz may get bumped back further after his engine blew in spectacular fashion during Free Practice 2 as well. All of these penalties already drop their respective cars down into the bottom half of the grid. There were so many that Sky Sports had to specify the order they would be penalized. And these are on the low side. McLaren driver Stoffel Vandoorne got an insane 65 grid-place penalty at Spa-Francorchamps last weekend. It’s become excessive and absurd. Granted, these penalties came from a desire to keep costs down by limiting the number of engines teams can use. Anything F1 can do to keep costs more manageable for smaller teams is a good move, especially since we’ve seen several come and go quickly in recent years. However, I can’t imagine allowing a fifth set of power unit components for the year to give struggling teams a better shot at scoring in the points would be too bad. I hate the fact that we’re having to affect the racing because of the technical issues. I know you can say if a car breaks down in a race that’s a technical issue and you’ve affected the race, but I think the fans understand that. For a fan to stomach that his hero is on the back of the grid because he had to change the engine, that’s not great sport. Preach that gospel far and wide, brother, because it’s been my biggest source of irritation with recent F1 races. So, maybe F1 should find another penalty that doesn’t affect the results so much—at least for the smaller numbers of component swaps, such that teams who are clearly abusing the rules could still have results affected after a certain point. Brawn suggested a potential loss of constructors’ championship points, or the loss of allowed “tokens” for power unit changes to Motorsport.com—both of which would get the job done. I’m sure the same minds who give us cars capable of pulling G-forces that near those of a fighter jet can come up with something creatively onerous that would leave the qualifying results alone. But something’s got to give. I’m tired of tuning into qualifying only to have the results I see play out on track get owned by grid penalties on top of grid penalties. Luckily, there’s hope now that even F1's higher-ups are as sick of the practice as I am. Do us a solid and change that for next year, please.